The representatives of the nuclear institutions of Kazakhstan who visited ITER last Tuesday stated it simply and clearly: they are very interested in collaborating with ITER. In the discussion that took place with ITER Director-General Bernard Bigot, Erlan Batyrbekov, director of the Kazakhstan Nuclear National Center, offered to establish a legal cooperation framework between ITER and the institution he heads. The largest of the Central Asian republics (5.5 times the size of France), Kazakhstan has immense mineral resources and a strong scientific and technological infrastructure inherited from its Soviet past and expanded since the country's independence in 1991. Kazakhstan also has a tokamak that happens to share with ITER the same "godfather": Evgeny Velikhov, the Russian scientist who was instrumental in the launching of the ITER Project in the mid-1980s, and who played a similar role a dozen years later for the Kazakhstan Material Testing (КТМ) tokamak. ITER and Kazakhstan go back a long way. 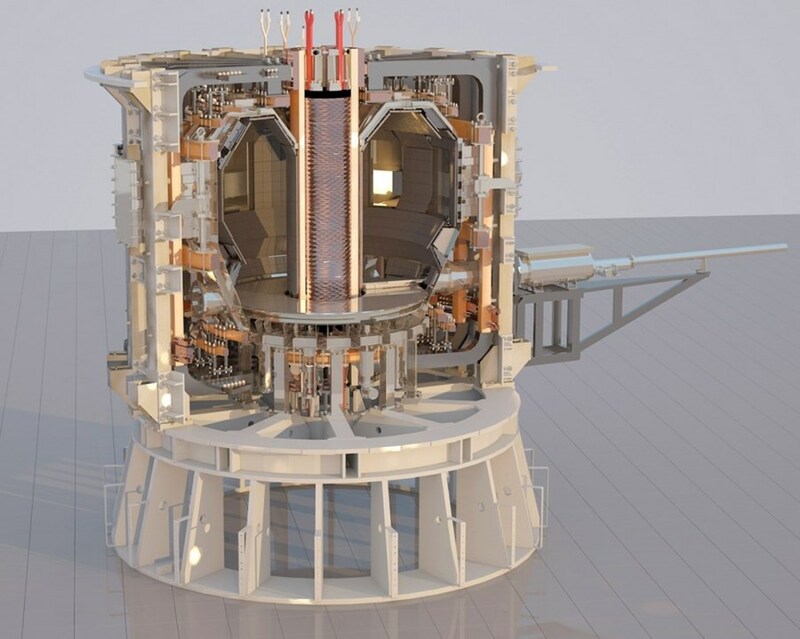 Kazakhstani personnel and institutions were involved in the early ITER design phase during the Soviet period, and as early as 2007 the country expressed an intention to continue its participation in the project. 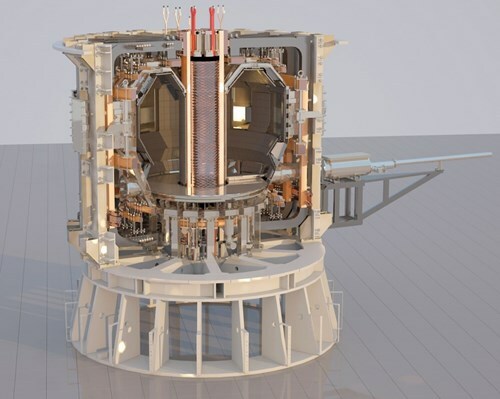 A collaboration between the Russian Federation and the Republic of Kazakhstan, KTM is a spherical tokamak with a major plasma radius of 0.9 metre, a plasma current of 750 kA and a toroidal magnetic field of 1 Tesla. Inside KTM's "movable" divertor 20 compartments can accommodate material samples that can be loaded and unloaded without loss of vacuum inside the chamber. The heat load deposited on KTM's divertor by the hydrogen-deuterium plasmas is expected to be in the range of 20MW per square metre—similar to what it will be in ITER. The KTM project was initiated in 1998, construction began in 2003, and a first plasma was produced in 2010 during a trial start-up. The "physical start-up" is scheduled in May-June of this year (before the opening of the world exhibit in Astana) and full-fledged operations with nominal plasma parameters will commence in 2020. Over the past ten years, several delegations from Kazakhstan have visited ITER. Last Tuesday, the proposal for collaboration was renewed. In the discussion that took place with ITER Director-General Bernard Bigot, Erlan Batyrbekov, director of the Kazakhstan Nuclear National Center, offered to establish a legal cooperation framework between ITER and the institution he heads. 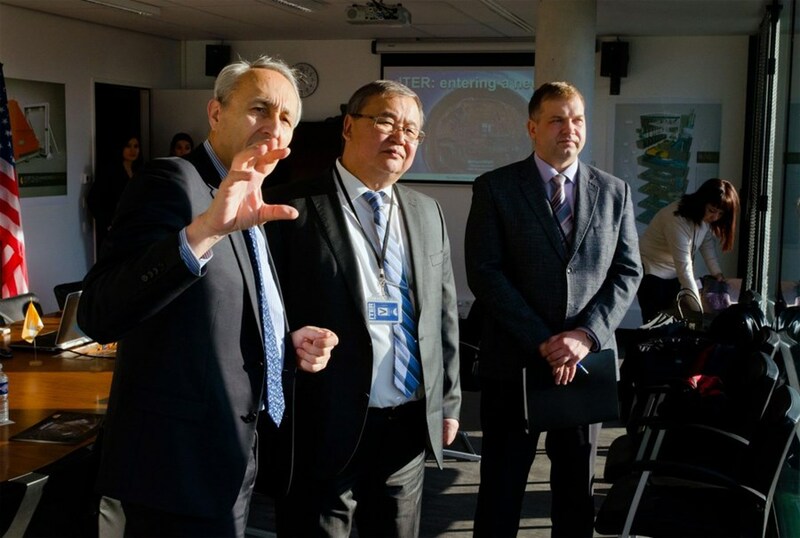 ( Erlan Batyrbekov was accompanied by Alexandr Vurim, Deputy-Director of the Institute of Atomic Energy, and Vladimir Vityuk, Head of Laboratory). Among other things, this collaboration would enable the ITER Organization to access the KTM facility for the testing of plasma-facing materials. The ITER Agreement is open to any nation that wishes to contribute to the project. Considering that ITER now has an overall project schedule through First Plasma (2025) and the start of Deuterium-Tritium fusion power experiments (2035), an increasing number of countries are considering cooperation. For this reason, ITER is evaluating the creation of a specific "ITER Partner" status that would be differentiated from full ITER Member status. The unanimous consent of the ITER Council is naturally required for any such collaboration or partnership. On a related note, the World Fair on "Future Energy" will open in June in Kazakhstan's capital, Astana. Kazakhstan's fusion program will be one of the centrepieces of the country's 5,000 m² pavilion; ITER will also be substantially represented at the Fair as an international exhibition within the French pavilion, featuring mockups, videos, and newly developed animations. The Chinese Domestic Agency will also feature ITER in a display in the Chinese pavilion, where it will unveil a new ITER Tokamak model.